Construction of a steel-framed sports centre in Derby has reached the halfway mark and is already taking bookings for its opening in 2014. The Derby Multi-sports Arena was one of the first Olympics legacy projects to get under way following last year’s Games. Earthworks began in October 2012 on the former car park site, with the erection of the arena’s steel frame commencing in June this year. Funded by Derby City Council and Sport England (which has invested £3m through its Iconic Facilities Olympic and Paralympic legacy fund), the 14,500m2 arena is being built next to Derby County Football Club’s Pride Park Stadium. The arena is part of Derby Council’s £50m investment in leisure facilities for the city. The three-storey Multi-sports Arena will contain a main sports hall the size of 12 badminton courts at ground floor, a 250m national standard indoor cycling track on the first floor and fitness studios and offices on the second floor. Plant and meeting rooms occupy the third. Prior to being a car park, the site for the new Derby Multi-sports Arena was a landfill dating back to the 1960s. It was decommissioned and covered with a capping layer by the late 1980s. Pipes continue to release any gases which build up. Bowmer and Kirkland’s contract has involved relocating the 600 parking spaces to a nearby site and drive 1,300 precast piles between 8m and 12m deep into the ground for the foundations of the new arena. Driven piles were considered to be the most suitable, since augured piles would have brought up contaminated soil from the landfill. The piles allow the structure to be supported by ground below the base of the landfill, since the landfill is liable to sink over time. The contractor has also installed a network of pilecaps and groundbeams to correspond with column locations for the superstructure, so that none of the load from the superstructure or infrastructure is taken by the landfill element of the stratum. “None of the structure actually sits on the ground (landfill). The main hall is supported off piles; even manholes and drainage have to be supported off piles,” explains Bowmer and Kirkland project manager Scott Millington. 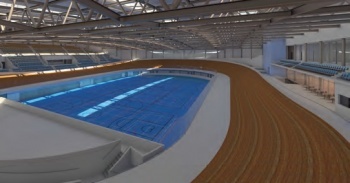 The arena has attracted attention for its cycling facilities and is already taking bookings for when it opens in 2014. It will be the sixth indoor cycling track in the UK – others are located in Manchester, Glasgow, Newport (south Wales), Southampton and London. The Derby site will also include a 1.5km outdoor closed cycle circuit. Designed by architect FaulknerBrowns, the arena building is diamond-shaped with chamfered corners. Its main entrance is on the western corner and the oval cycling track sits east-west across opposite diagonals of the building at the first floor. The centre of the track is open to the main sports hall below. This layout allows the arena the flexibility to be used as a 5,000-seater concert venue as well as for sports. Steel erection has proceeded from the north side of the site to the south. The building has been split into four sections across the site to allow phased handover. Each quarter is completed up to roof level before the next phase gets under way. 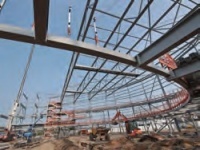 Steel erection is currently focusing on hitting key dates for installing the pre-cambered 84m long trusses at roof level over the main hall area. Main contractor is Derbyshire-based Bowmer and Kirkland, with steelwork contractor Billington Structures. Billington is also installing precast stairs, terracing and hollowcore floors. 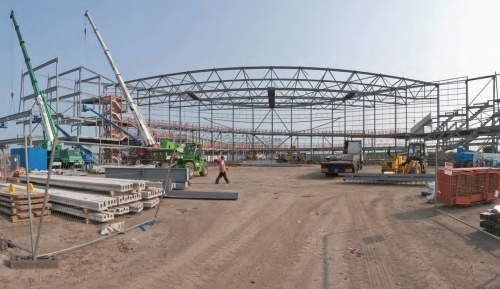 When Construction News visited the site in July, half the steelwork had been erected, including the curved steel beams of the inside edge of the cycling track. The impression created by the track is that of a dramatic balcony overlooking the main sports hall. Two 75-tonne capacity mobile cranes lift most of the 700 tonnes of steelwork, assisted by MEWPs. But when the long roof trusses are being erected, two extra cranes are required. The trusses are erected in up to four sections, depending on their length. There is usually enough room for cranes to move into the most appropriate position for all lifts, apart from when neighbouring Derby County is playing a home match, when site activity is confined to a much tighter footprint and the site car park is given over to the football club. With so much of the building being manufactured offsite – the steelwork, precast floors, stairs and terracing – the quality of finish will be high, but to keep on programme the contractor has had to keep a strong focus on site progress and timing deliveries correctly. “Our main challenge on this project is to co-ordinate deliveries so that once the steelwork is up, we’re not waiting for the precast units to arrive,” says Bowmer and Kirkland project manager Scott Millington. By September, the steelwork will be complete and the roof cladding will go on. A specialist contractor is installing the cycling track to ensure it is built to the correct specifications and performance standards for competitions. “The track will be installed next February, when the building will be enclosed and the internal temperature is within the correct range,” adds Mr Millington. As with any design-and-build contract, Bowmer and Kirkland is looking closely at the design to see how details and processes can work more efficiently. The contractor is currently working on the building’s ‘eyelid’ windows – slithers of glazing – which punch through the cladding. “Apart from sorting out their exact geometry, we’re also looking at ways in which we can install the mullions (for the windows) with the cladding and then come back to fit the final glazing panels,” Mr Millington explains. Bowmer and Kirkland will hand over the building to client Derby City Council in October 2014. The arena is due to open the following month. Bowmer and Kirkland has worked closely with steelwork contractor Billington Structures to design in temporary edge protection details with the main steelwork design. “Holes are pre-drilled into the edge-beams for the edge protection fixings and coordinated with the final finish,” says Billington project manager Kevin Meers. The result is that edge protection in the form of metal barriers can be easily installed to a high standard at the same time as the main steelwork is erected. It can then stay in place until the permanent edge protection – either cladding or railings – is installed. Crucially, the edge protection’s location in relation to the permanent cladding, shuttering or edge detail, has been carefully considered so that it can remain in place until the permanent edge protection can be used. The arena will use a combined heat and power plant to generate electricity on site and provide heating and hot water for changing rooms and toilets. The target is for a BREEAM rating of Very Good. Low environmental impact, durable cladding systems to minimise materials consumption and waste generation are also being used. To minimise materials consumption and road transport to and from site as far as possible, site materials are being reused in situ, or sourced from a local supplier. The project has also adopted a comprehensive ecological management plan to minimise impact on the adjacent nature reserve and River Trent.